Falling oil output and a weakening fiscal account in Belize may hurt growth and cause losses to bondholders two and a half years after it defaulted on about $550 million of bonds, Moody’s Investors Service said. Oil production in the Central American nation wedged between Mexico and Guatemala declined 20 percent in January through August 2014 from a year earlier and will fall to less than 500,000 barrels this year after declining 23 percent in 2013, Moody’s said in a report distributed Tuesday. 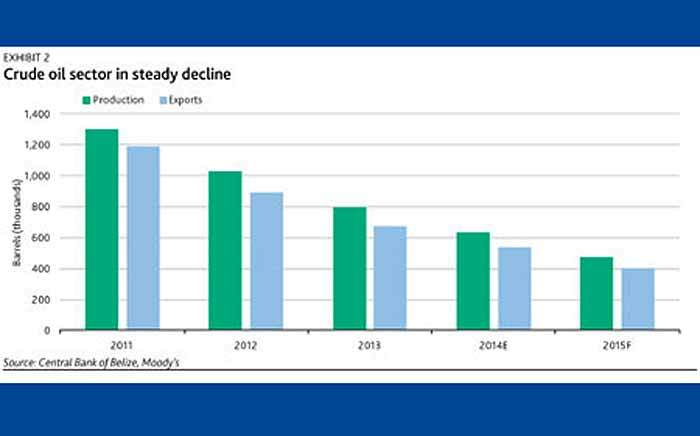 The country’s primary surplus, or budget balance before interest payments, will shift to a deficit in 2015, Moody’s said. The yield on the country’s 2038 bonds was unchanged at 9.19 percent as of 12:52 p.m. New York time. The price has risen to 73.14 cents from about 68 cents a year earlier. Moody’s rates the country Caa2, eight levels below investment grade and in the same category as Cuba. Officials at Belize’s Finance Ministry didn’t immediately respond to messages left by Bloomberg News seeking comment on the report. Belize’s $1.7 billion economy expanded 3 percent in 2014 and is projected to grow 2.5 percent to 3 percent this year, Moody’s said. About 332,000 people live in the country, which is known for its barrier reef and Mayan ruins. Belize’s oil revenues continue to fall, even as we move into 2015 and according to the latest economic report issued by the Statistical Institute of Belize (SIB), there were no crude exports in January 2015, contrasting with BZ$13.1 million in exports the same time last year. All in all, oil revenues paid to the Government of Belize have also been on a sharp decline. Oil revenues made up almost 1 in every 10 dollars the government received in 2010; today, it makes us less than 2 out of every 100 bucks paid into its coffers. And the situation where oil revenues are concerned is not forecast to improve unless Belize declares a new commercial discovery. This slump in oil production is countered by strong performances in tourism and agriculture and if things continue to look up on those two fronts, it could allay fears that bondholders who had subscribed to the restructured bond offering which Belize made in 2013 could face substantial risks. In detailing the potential downside risks, Moody’s said that elections are scheduled for March 2017 and they expect fiscal easing ahead of the vote. It also said that government revenues may not respond as forcefully as expected to tax measures implemented in 2014 and which are in the process of being implemented in 2015. Also, the next general election precedes the first step-up in the coupon rate on the restructured bonds in 2018 and the ongoing litigation on the nationalization of the Belize Electricity Limited (BEL) and Belize Telemedia Limited (BTL) could result in a fiscal cost of anywhere between 6% and 30% of GDP depending on valuation estimates, Moody’s added. It pointed out that the Government’s bill for wages, salaries and pensions makes up 40% of its spending and this bill is set to increase with further wage adjustments. This is coupled with higher public spending on road infrastructure, which, Moody’s said, is likely to lead to the first budget deficit for the Government since 2006. Moody’s says that agriculture remains the sector with the highest growth potential in Belize’s economy, due to the abundance of fertile land and possibility for large economies of scale as production efficiency increases. “In addition, the tourism industry is set to benefit from further improvements to the road network and tourism facilities, as the authorities channel pre-election spending into infrastructure investment. Longer-term tourism prospects also appear favorable, but it remains to be seen how significant these could contribute to economic diversification and balance of payments dynamics going forward,” it added.